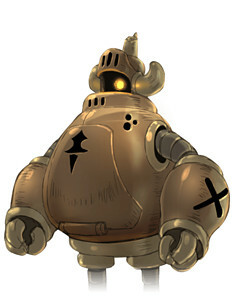 Description A round brass golem radiating warmth. A visiting customer practically forced the bar owner to take ownership of it long before Lusit was born, since then it's served as the bar mascot. Although it can communicate with others in the common tongue with broken speech, its choice of vocabulary is peculiarly eccentric. It possesses cooking functions in its "belly" allowing it to boil water, heat ingredients up and perform other culinary duties. A round brass golem radiating warmth. A visiting customer practically forced the bar owner to take ownership of it long before Lusit was born, since then it's served as the bar mascot. Although it can communicate with others in the common tongue with broken speech, its choice of vocabulary is peculiarly eccentric. It possesses cooking functions in its "belly" allowing it to boil water, heat ingredients up and perform other culinary duties. [Spoiler] Originally the mass-produced model of a construct created by the Varsus aliens, he did not originally possess self-awareness but has since grown under the care of Neil and Lusit. Monos kept Lusit safe for over a hundred years as the construct's inorganic form rendered it safe from attacks from the Evil Deity's appendages. After the gnome merchant Dominus found a spare part for Monos, some maintenance and a memory wipe allowed Edgar in his replica form to pilot Monos. Although different from his own adventuring days, the combination of heavy armour and strong attacks proved too big an allure for Edgar to resist piloting Monos together with expeditionary parties. What's surprising is how capable Monos is during exploration despite 90% of his functions disabled. A round brass golem radiating warmth. A visiting customer practically forced the bar owner to take ownership of it long before Lusit was born, since then it's served as the bar mascot. Although it can communicate with others in the common tongue with broken speech, its choice of vocabulary is peculiarly eccentric. <hidden by spoiler settings> Originally the mass-produced model of a construct created by the Varsus aliens, he did not originally possess self-awareness but has since grown under the care of Neil and Lusit. Monos kept Lusit safe for over a hundred years as the construct's inorganic form rendered it safe from attacks from the Evil Deity's appendages. Monos accepts the offer to return to the alien planet, but will not use it for the present as he wishes to see more of the world in the company of Neil, Lusit and the guild.